This past summer, my family and I spent almost two months on the other side of Trump’s proposed wall. We went to Mexico to learn Spanish, and, of course, relax a bit. 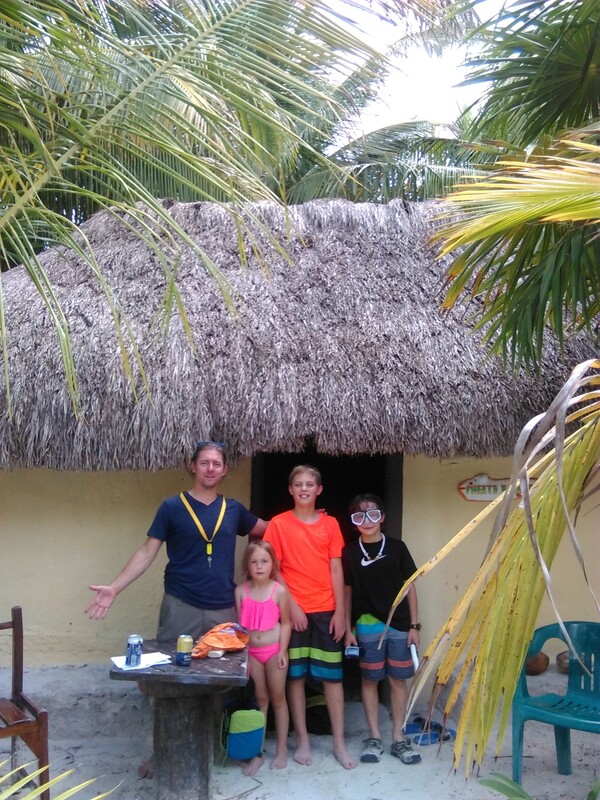 The beaches were beautiful, the snorkeling amazing, the Mayan ruins breath-taking, and the Metzli Family Spanish School was a blast. But it was the stories we heard from local friends we made that were the most compelling thing about our temporary home. I quickly learned to ask two questions whenever I met a local who spoke perfect English: where did you live in the US? How did you end up back here? The answers were never what I expected. It was the gentlemen selling beautiful Mayan crafts at a hidden flea market in Puerto Morales who surprised me the most. I was practicing my Espanol, trying to tell a brash vendor that I was just looking, when my new friend stepped in. He looked like he was dressed for a golf outing in our home town, St. Paul, with his polo shirt, curled baseball cap, and sport sunglasses. He laughed at my Spanish and said, with no detectable accent, “You can’t buy, if you don’t look, right?” We spoke for a few minutes about the crafts in his little backwoods shop. Then I just had to ask my two questions. Where did you live in the US? How’d you end up back here? He smiled, and then he blew my mind. He was the son of migrant workers. He had spent his entire childhood traveling the United States, following his parents from crop to crop, seeing more of America than most Americans: by the end of his youth, he had called home to eleven states and had attended enough US middle and high schools to write a guide book for parents. He’d lived as far north as Michigan, during blueberry season, and finally graduated in Dallas. These were the startling moments as an American in Mexico, when you looked at someone who was supposed to be “foreign” and realized they could probably teach you a thing or two about your country. The answer to my second question, of how he ended up back here, back in Mexico, in a tiny vendor’s shack in a small fishing village, surprised me even more. I always asked my second question with trepidation, because I typically got answers involving deportation, or sad stories like our friend at the taco stand on the main square, who came back to Mexico for a visit after sixteen years in Oregon and lost the papers he needed to return to the states. “Don’t copies of something like that exist?” I had asked. “Nope. And it would take me a year to go through the whole process again,” he said. “I just don’t have the energy for that anymore, not with how things are going there.” How things are going there described the ever present awareness in Mexico that their neighbor to the north disliked them so much, they wanted to build a wall to keep them all out. I feared hearing heart-wrenching tales like the one of our kind concierge at Hotel Arrecifes, who, to my family’s surprise, lived in our home town, the Twin Cities, longer than we had. He was more Minnesotan than my kids! His story is worthy of a novel: it starts in Mexico, at an orphanage founded by an American (he still has a picture on his phone of his sisters and him as children, posing with their American benefactor). When the group he was raised with turned eighteen, going to America was just what they did. It wasn’t a decision, it was always the plan. He had lived in one of our favorite neighborhoods in Minneapolis for two decades. He had a home, two kids, a job in a factory, an entire life. When he was arrested for a traffic violation and ushered through to immigration, an attorney told him that if he did things the right way, he had an excellent shot at becoming a citizen. So he tried, followed his attorney’s suggestions, and did things the right way. He was almost through the process when 9/11 happened. A few weeks later, at forty years old, he was shipped back to a “home” he had not seen since he was eighteen. Then he made a mistake. Instead of continuing to pursue the laborious citizenship process from Mexico, he snuck back in, taking the notorious desert journey with a coyote (another novel worthy story). He had two kids he wanted to get back to. He made it, for a while. The next time he was caught, he knew he’d really blown his chances at citizenship. He still has some hope that his now adult children will help him find his way back. Until then, he carries our luggage and tells us where to find good seafood. Another young man I met, who was trying to talk us into a pricey tour of Chichen Itza, laughed when I joked that his English was better than mine. “I just picked it up last week,” he teased back. Then he smiled. Something about him was so familiar: the neck full of tattoos, the mischievous smirk, the arms hanging low in front as if he was about to start a free-style rap. He had reminded me so many of the young, smart, and restless Latino boys I work with in the US, raised in poverty, looking for something better, struggling between their parents dreams of a better life and the call of the streets. But back to the gentleman dressed for the golf course who travelled the migrant-worker circuit as a child. He had another answer to my second question. He had settled in the US. He was a citizen. This guy would not look out of place in a suburban sports bar. “So how’d you end up back here,” I asked, though my real question was, why’d you move back here after your parents spent so much time and effort getting and keeping you there in the US, everybody’s great hope, the Shangri-La of the modern age, so popular with the world that we need to build walls to keep people out. It makes you wonder, especially when you see us big, loud Americans in line at the Walmart in Playa Del Carmen, buying our chips, beer, and souvenirs in bulk, perhaps hoping to feel less depressed over the next few days while we bask on the Mexican beach and enjoy cheap margaritas. Walls don’t protect, they depress. When you close off your world, you close off your heart. When you close off your heart, you lose what it is that makes you human. Here’s a look at our time in Mexico, featuring GoPro footage by my son, Oscar, and a new song by my band, The Falderals.